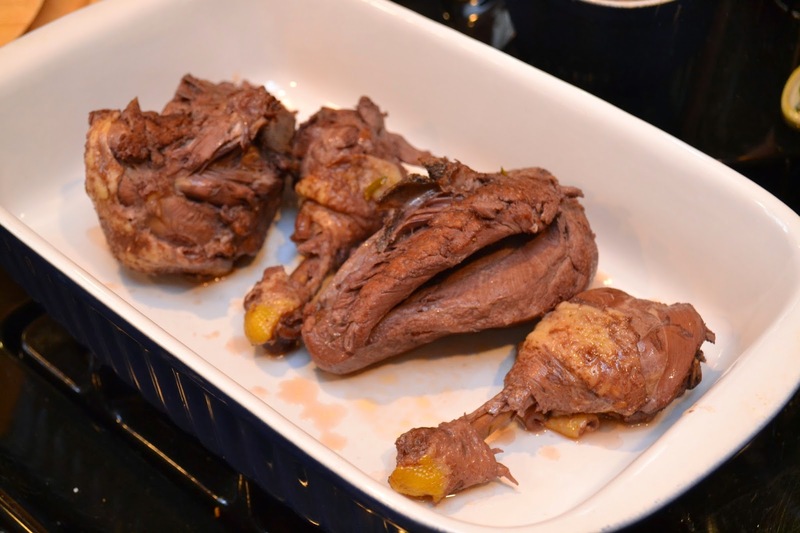 Here is one of our first attempts to make an official Julia Child recipe and it is daunting. 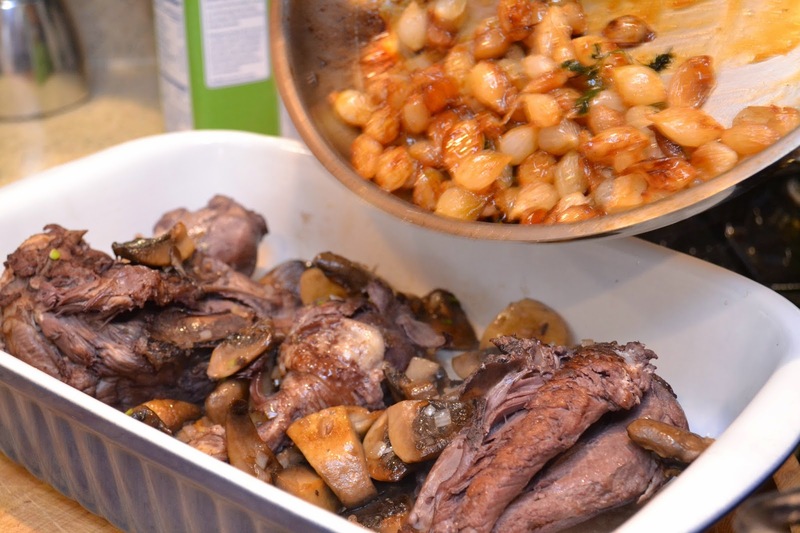 The famous Coq Au Vin. Now I know what you are thinking. So fancy and French. Well, as it turns out French peasant food is delightful and similar to any other comfort food that you may be used to. Just a little fancier and maybe consumed while wearing a beret. This is simply cook a chicken, sauté mushrooms, braise onions and prepare a sauce or gravy depending on where you are from. No big deal. Don't be intimidated. 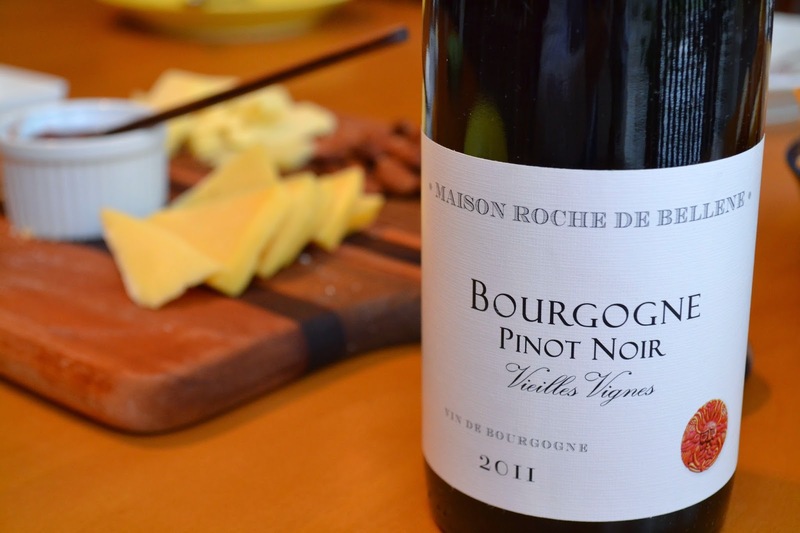 Pour a glass or two of wine and roll up your sleeves. We are just going to cook by numbers. 2.5 to 3 pound whole frying chicken cut up. No point in taking a giant ingredient photo. Let's just get started. First things first, let's prepare a snack to get us through this adventure. In your heavy dutch oven sauté the diced bacon in hot butter until it is very lightly browned. Remove to side dish. Or don't do this. We skipped this step as our guests were not fans of pork. Then brown the chicken with salt and pepper a pinch or two each. 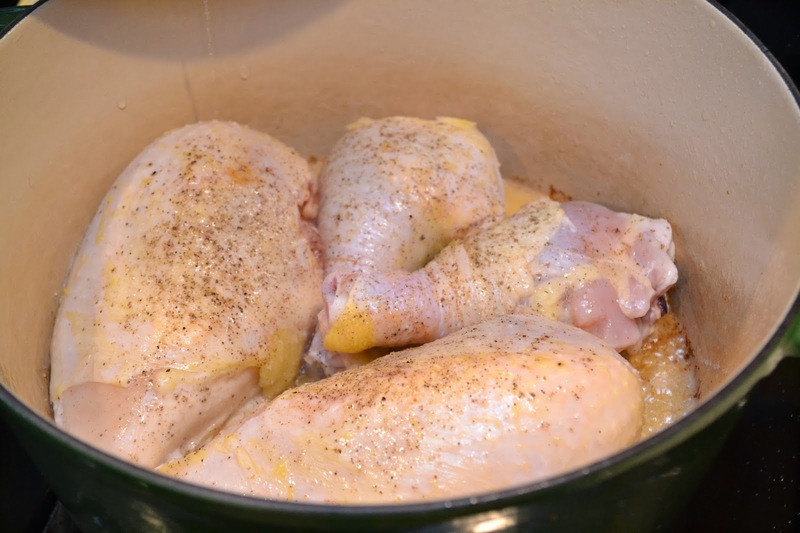 Return the bacon to the casserole, cover and cook slowly for 10 minutes turning the chicken once. 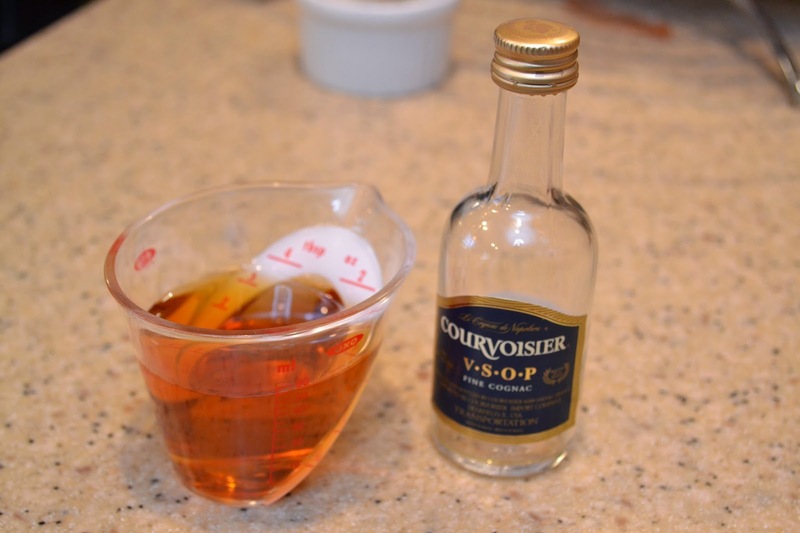 Uncover and pour in the cognac. Ignite the cognac with a match. (invite your friends over for this folks it is pretty impressive). Shake until flame subsides. Pour in the wine. Saving a little for the chef. It is such hard work cooking. 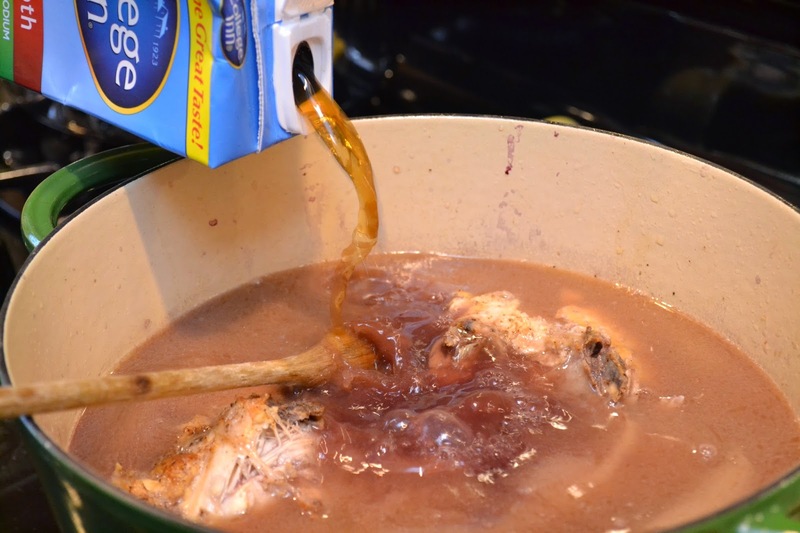 Add just enough stock to cover the chicken. 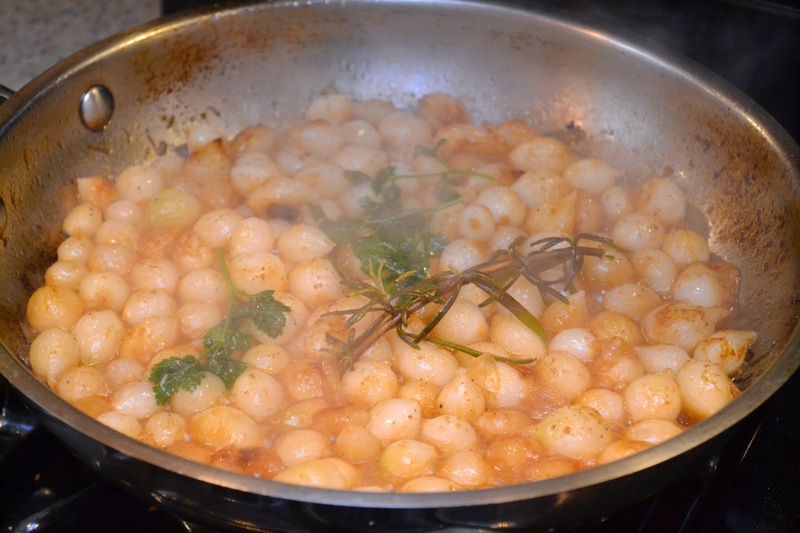 Stir in tomato paste, garlic and herbs. Bring to simmer. Cover and simmer slowly for 20 to 25 minutes. Until chicken is tender and juices run clear. Remove the chicken to the side. While the chicken is cooking... prepare the onions and mushrooms - skip down to below to see this effort. Then come back. 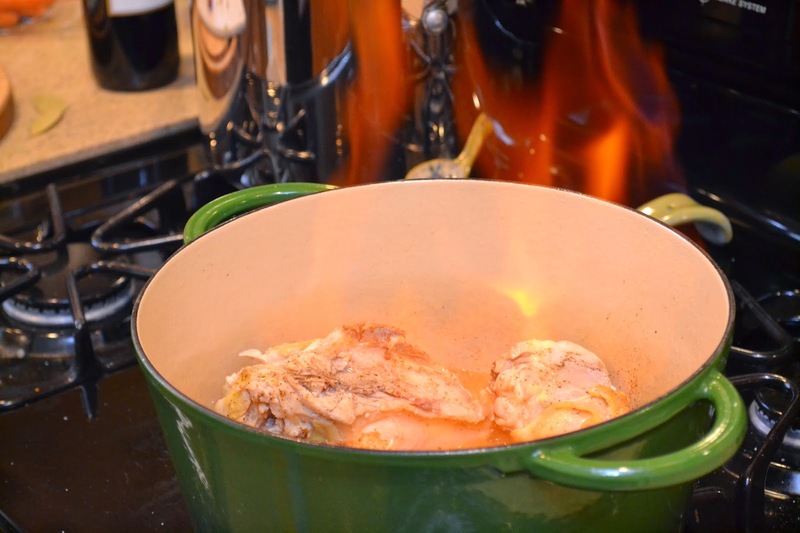 Simmer the chicken cooking liquid in the casserole for 1 to 2 minutes, skim off the fat. Then raise the heat and boil rapidly, reducing the liquid to about 2.25 cups. Then salt and pepper to taste... Remove from heat and discard bay leaf. 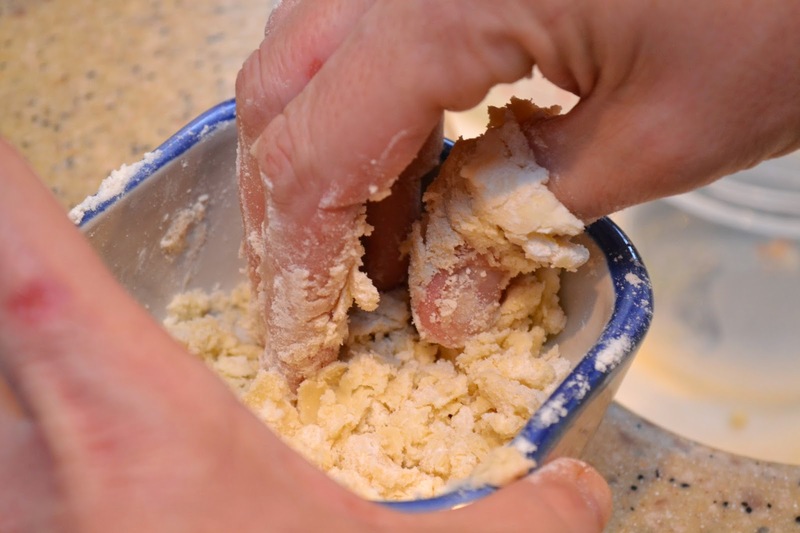 Blend the butter and flour together into a smooth paste (called beurre manie). 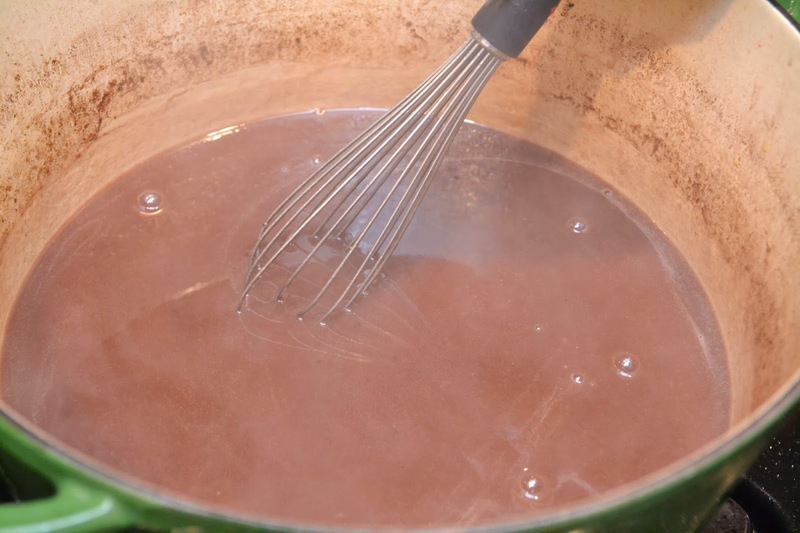 Beat the paste into the hot liquid with a wisk. 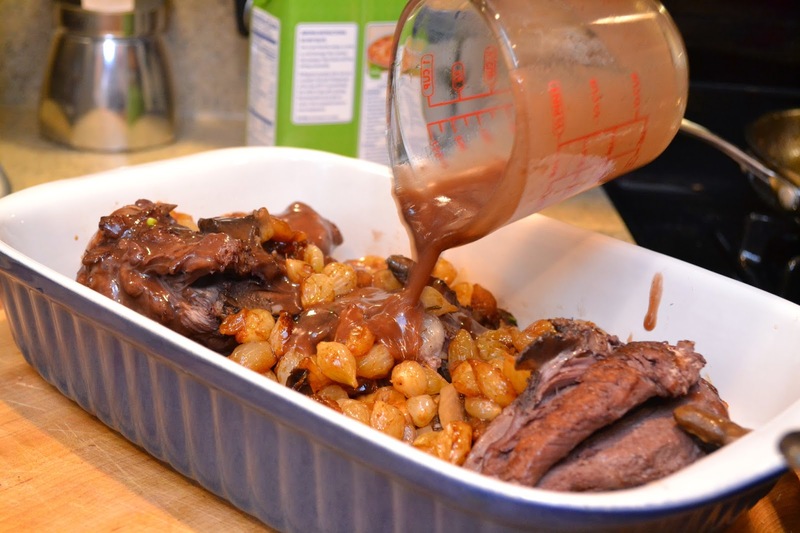 Bring to simmer for 1-2 minutes to thicken the sauce so that it will coat a spoon. 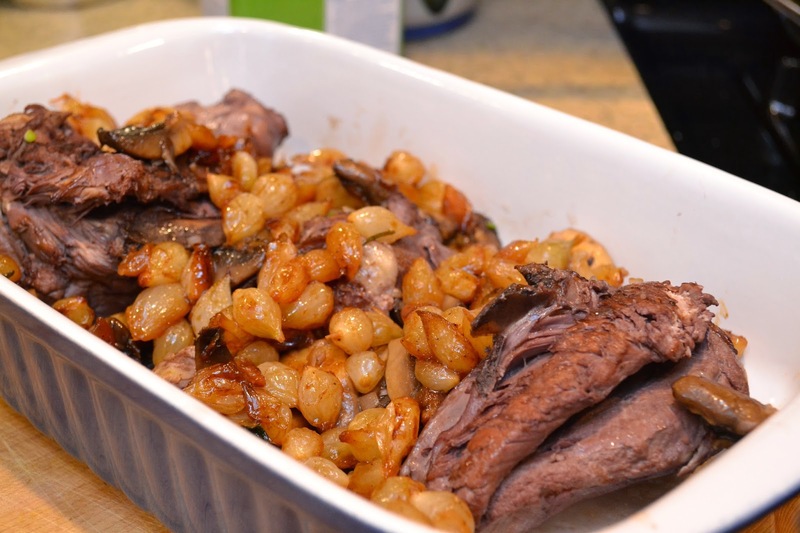 Arrange chicken in a casserole, place mushrooms and onions around it and baste with the sauce. 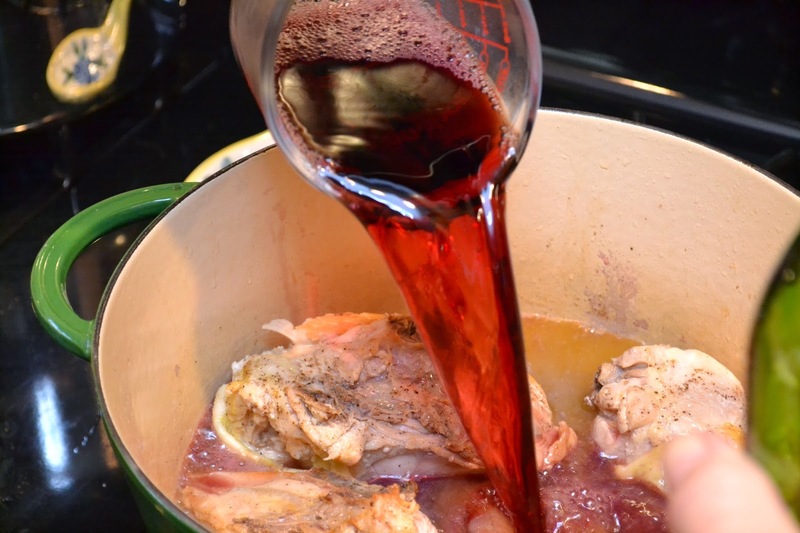 If the dish is not to be served immediately, make a film on top with stock. set aside uncovered for no more than 1 hour. or cool and refrigerate until needed. Serve on platter decorated with sprigs of parsley. 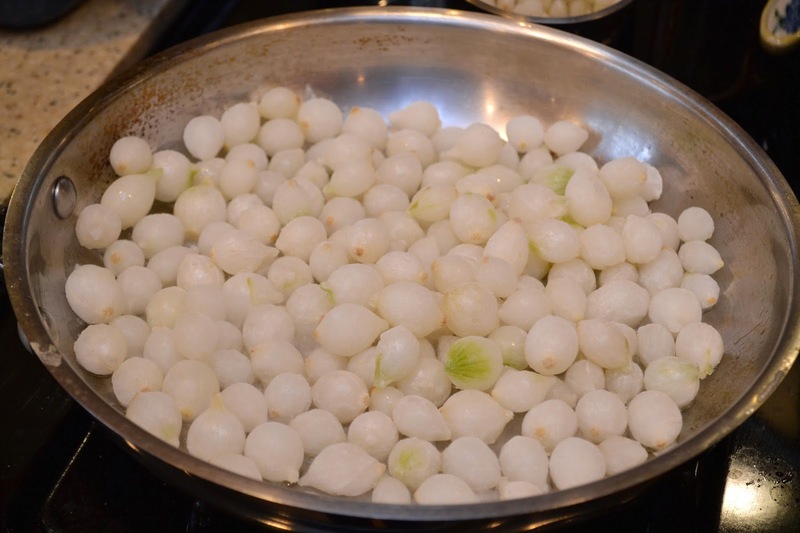 When the butter and oil are bubbling in a skillet, add the onions and sauce over medium heat for 10 minutes, rolling the onions about so they will brown evenly. Be careful to not break the skins up too much. Pour in the stock, season to taste and add the herb teabag. 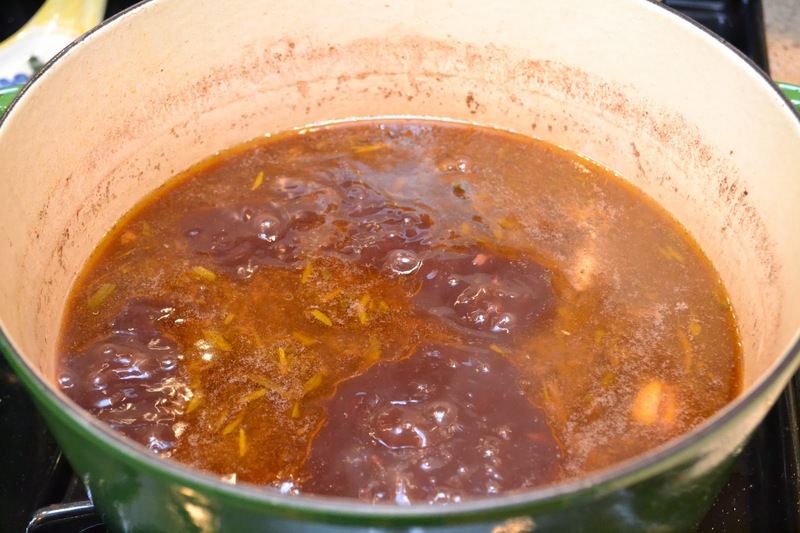 Cover and simmer for 15 to 20 minutes until the onions are tender and the liquid has evaporated. Remove the teabag or just plain herbs and serve. Place the skillet over high heat with the butter and oil. As soon as you see the butter foam, add the mushrooms. Toss and shake the pan for 4 to 5 minutes. 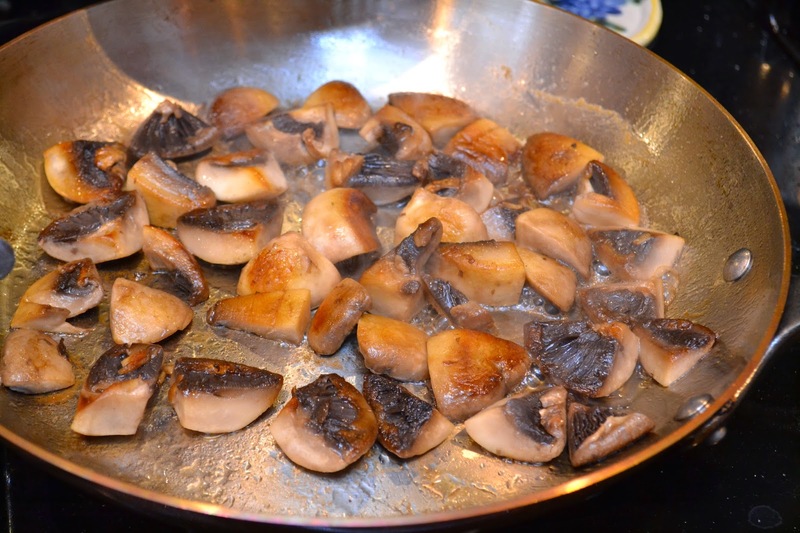 As soon as the mushrooms begin to brown, remove from heat. 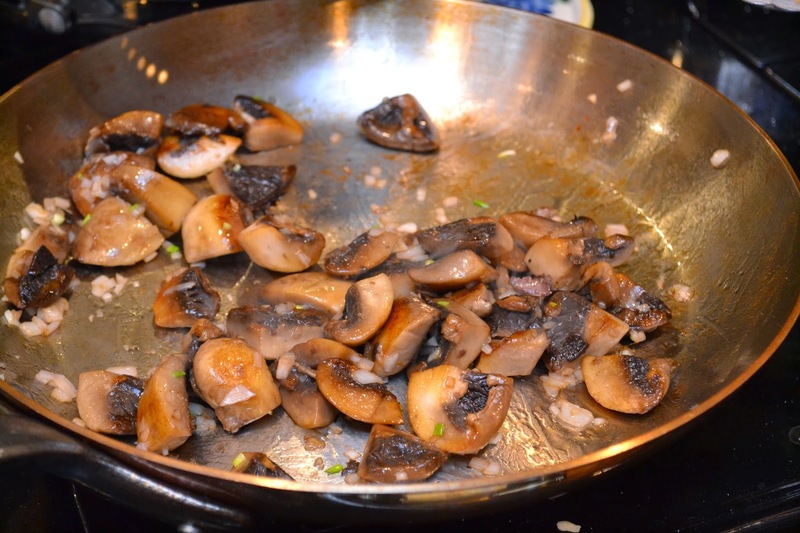 Toss the shallots with the mushrooms and sauce over medium heat for 2 more minutes. Season to taste and serve. 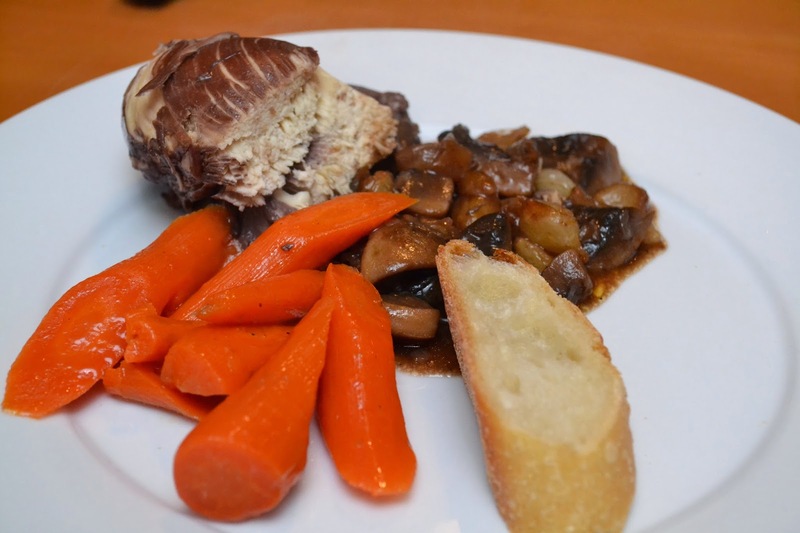 Holy cow we just made Coq Au Vin! and Julia taught us! So good and comforting. Classic French peasant food.